The Barrio El Chorrillo is a subdivision in Panama City. It was founded in 1915, when immigrants started settling down to work on the construction of the Panama Canal. The US Americans were living in a strictly separated zone, where locals were not allowed to go until the 1990ies. 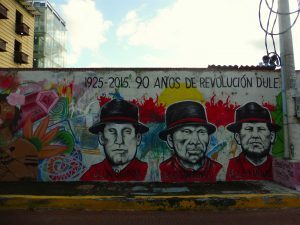 During the US Invasion in Panama, from Dec. 1989 to Jan. 1990, numerous people got killed and El Chorrillo was where most of the civilian casualties occurred. The poor neighborhood El Chorrillo has a bad reputation in Panama. It is widely known for social problems, crimes, violence and former gangs. 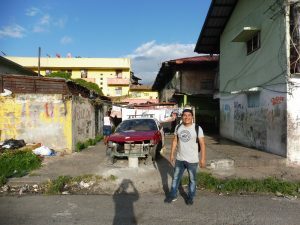 It is one of the poorest areas in Panama with a population of about 20.000 people. 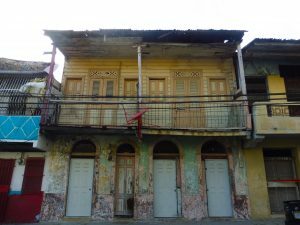 In contrast, Casco Viejo is Panama City’s historic center with beautifully renovated colonial buildings, stylish restaurants, fancy bars and hotels. Nowadays, it is a safe area to walk around and very popular for tourists. Only 20 years ago, it was a dangerous area, often ruled by gangs. When the government and private investors started seeing the potential of this area, they started removing the poor people from this area. Many of them moved to El Chorrillo, only a stone’s throw away from Casco Viejo. To be honest I wasn’t sure, if it was the best idea to trust a stranger and go to an area which is considered to be the most dangerous in Panama City. But my curiosity was bigger than my fear and before I knew it, I found myself in El Chorrillo. 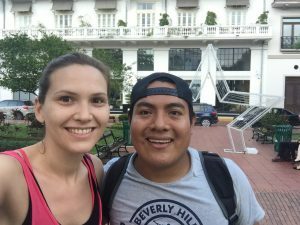 I met Victor at Plaza Herrera in Casco Viejo and after a few walking minutes we were already in El Chorrillo. I didn’t realize before how close this poor area is to Casco Viejo. It was like entering another world within just a few minutes. 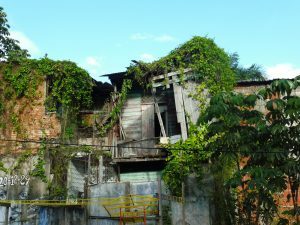 You can also find old colonial buildings, but they are not renovated since they have been built. There are apartment buildings, with colorful, but mostly old facades, where freshly washed clothes are hanging for drying. Some houses are sporadically made of wood, almost falling apart. I also saw a lot of street art about sports, people of El Chorrillo and some who remind of the US invasion. Victor walked around with me, telling me about the history, daily life and living conditions of the locals. He showed me the sports hall, where the famous boxer Roberto Duran trained and other places that are related to sport, especially to football. The locals love it and are proud that a few “Chorrillans” became famous athletes. 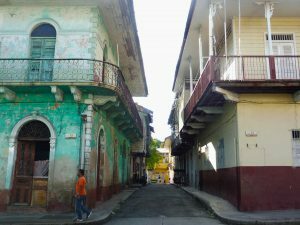 The neighborhood is very lively, with children running around in the streets, people chatting and Latin music sounds in every corner. I guess that not a lot of Gringos visit this area, so the locals looked at me quite surprised when they saw me. But they always greeted me friendly with a smile. So we stopped a few times, Victor explained his idea of the tour to them and they started chatting and telling me things about their neighborhood. We also visited a Police station, where Victor’s weekly program „Educate me and you educate a nation“, is taking place. The idea is to get the kids away from the street and give them a place to learn and play. Especially tourists are welcome to interact with the kids and learn English with them. Victor wants the locals and tourists to connect, exchange knowledge from different countries, traditions and cultures. You can meet the kids, help to educate them and have an authentic experience in Panama. The program is quite new, but Victor wants to develop it with more and different classes in English, music and art. In the long term he plans to educate and empower also the mothers of the children. 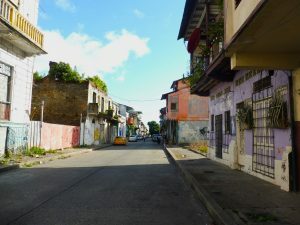 In Victors opinion, El Chorrillo is a safe place to walk around, even for tourists on their own. I’m not quite sure, if I can confirm that, but from what I have seen, it’s not as dangerous as I heard it is. The locals are very friendly and welcoming and I felt safe with Victor. 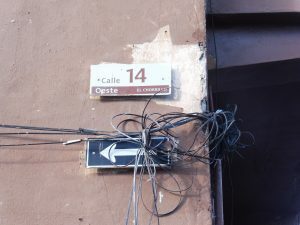 For sure, it’s not as safe as Casco Viejo to walk around as a tourist – especially after sunset. Even though I had a very good experience there, I would not go there just by myself. After walking around in El Chorrillo, Victor brought me back to our starting point. The tour took around 1,5 hours and was 35 USD. 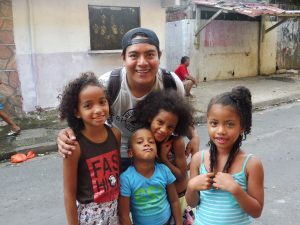 If you are interested in seeing another, non-touristy side of Panama or spend time with the kids of this area, connect with Victor on Facebook @Local in PTY or send him an E-Mail. 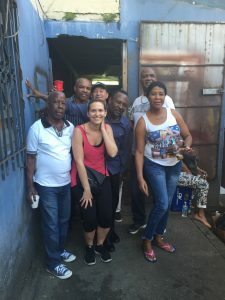 I guarantee you an amazing, authentic experience in Panama City! 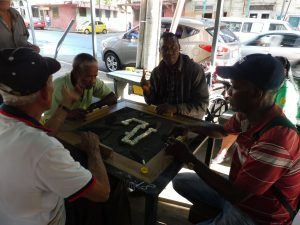 Really a great article about El Chorrillo! 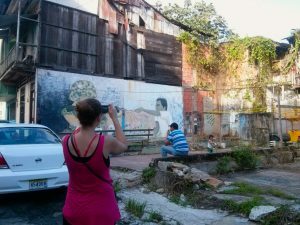 There are a lot of tourist guides selling just the main attraction of the city, but there are plenty of places unknown, like El Chorrillo for example and also historical, that people who come to Panama are missing them! Thank you very much for your feedback, Ginniva! Yes, this tour is a unique possibility to learn about the country, the culture, history and people. Panama has a lot of wonderful places to explore and it’s definitely important to see more than just the main tourist attractions!